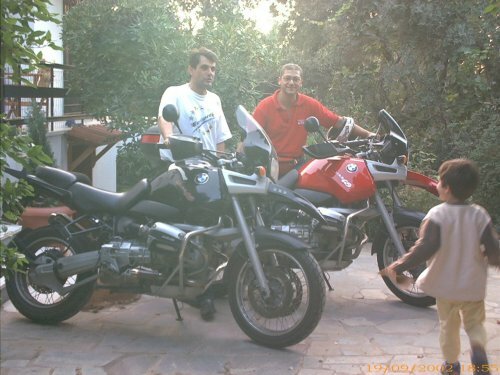 Greek BMW R1100GS... Two of them! 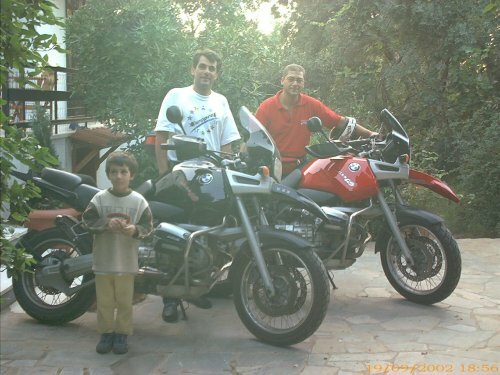 A few days ago I got an email from another fellow R1100GS owner who happened to see my site. 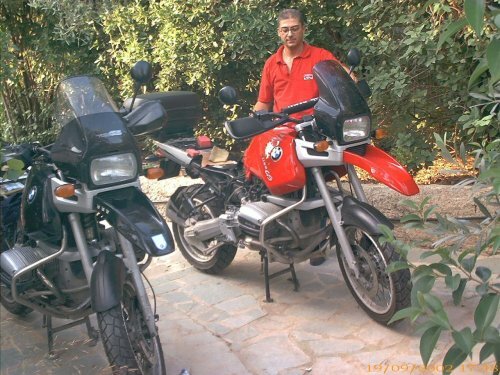 So, today we met, at my home, and we did some TLC on the GS's, but mostly chatting happily, a cup of coffee and a check of the batteries on both models. 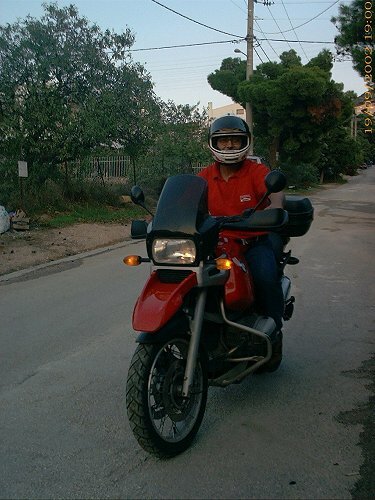 Spyros' GS is a red one, a '95 model, with plastic tank, which he bought used about 2 months and 1000km's ago! 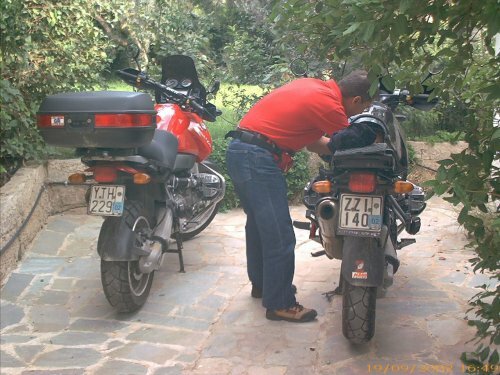 So far he is learning what the GS is, and have already had new MEtzeler Tourance tires fitted to it. The bike has ABS, RID, BMW hard bags, and an Italian made topcase (sorry, I didn't catch the name!). 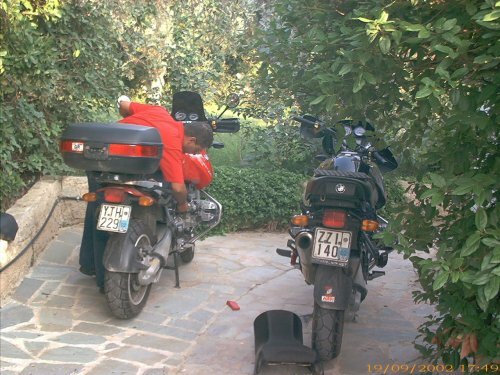 Then it was time for his bike's battery. The red GS needed some topping up, even though the battery was about a year old only. 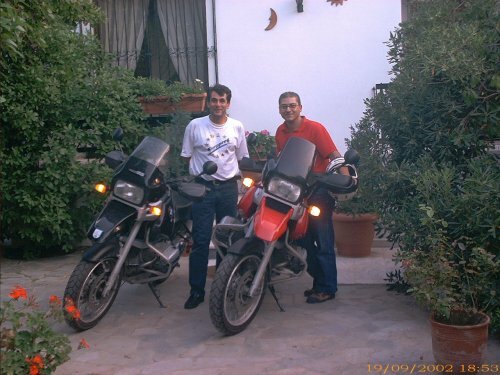 In a perfect synchronisation, both bikes' alarms flashed simultaneously! See the lovely... models! Ops! Jason wants to be in the pic too! Hold it Mom! Okay! All set! say "cheese"! Hey, Spyro! 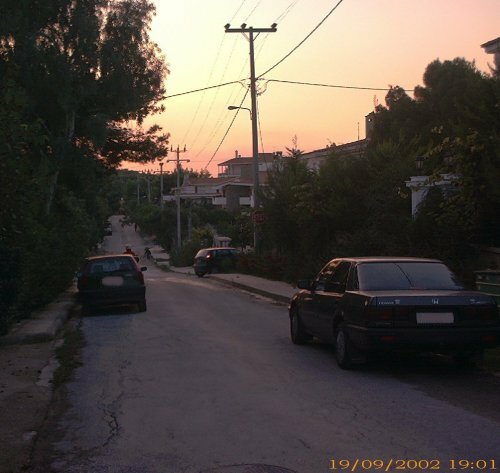 Το παρμπριζ μου ειναι ψηλότερο απο το δικό σου!!! doesn't he remind you of that song... "I'm a lonely cowboy..." as he ventures into the sunset?! 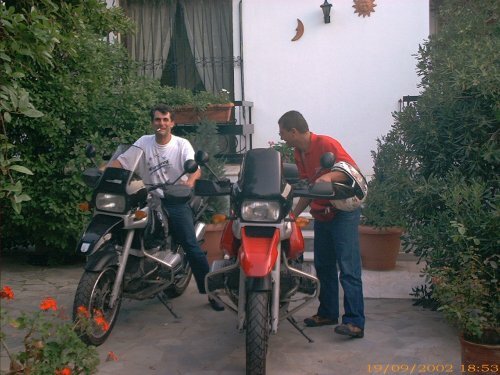 Sept. 25, 2002: This is the story by Spyros, himself! updated with 2 pics and a nice looking patent on Oct. 1, 2002. Certainly worth a look!